With plenty of outdoor activity to partake in year round in Colorado, those looking for an afternoon adventure in the springtime will have no issue finding something that suits them. One of the best and most popular spring activities in Colorado is ziplining. AVA’s Cliffside Zipline course, conveniently located just 30 minutes west of Denver, boasts beautiful colors that begin to sweep the surrounding mountains after the snow stops falling. Head into the high country to Buena Vista’s Mountaintop Zipline to watch the Arkansas Valley transform into a luscious vibrant area come springtime. Both of our courses will keep your heart racing with not only ziplines, but suspended bridges as well. 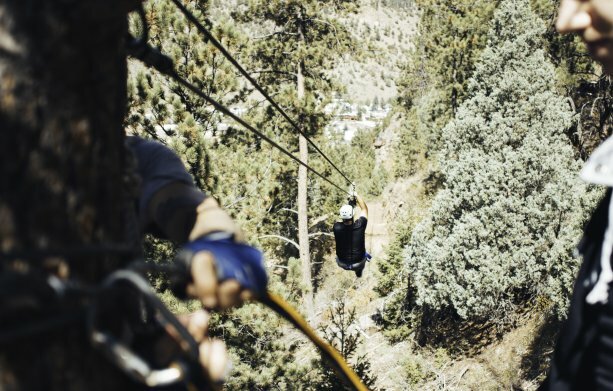 Our Idaho Springs Cliffside Zipline opens even before the spring solstice, so lucky for us, we don’t have to wait long over the winter to start soaring through the treetops again. This course was voted Best of the Rockies in 2017, and starting at the beginning of March, venture your way down the cliffside in Idaho Springs, CO on this 6-line course, which includes some jungle bridges and a “Surf Zip”. This zipline was built into the the natural elements surrounding the area, so you aren’t just zipping from tower to tower. AVA’s mountaineering adventure, the Colorado Via Ferrata, opens up at the beginning of March along with our Idaho Springs zipline tour. We like to explain it as “ziplining on steroids”, with elements such as traversing the cliffside via iron rungs and rappeling down a rock face to take part in before you zip back down to our outpost. Head to Buena Vista, Colorado starting at the end of April to fly above the Arkansas Valley on AVA’s Mountaintop Zipline. Incredible views of the surrounding mountain vistas and almost 4,000 feet of high-flying fun await you on the 7-line zipline course. You’ll also have the chance to challenge yourself on a swinging log bridge and hanging log staircase. 7 amazing ziplines spanning almost 4,000 feet of high-flying, heart-pumping fun! Lines range from 264 ft to 862 ft with great views of the Arkansas Valley area. Since our Cliffside Zipline and Via Ferrata tours open in March, you’ll have to be prepared for all types of weather ranging from snow days to sunny and 60 degrees. Even into May, there’s a potential for significant snow fall. Towards the front range and Idaho Springs you won’t have to worry so much, but our Mountaintop Zipline course in Buena Vista is located at nearly 8,000 feet in elevation, and flurries aren’t out of the picture until towards the end of May. What you can expect is to see the surrounding mountains of Colorado transform into a display of colorful flowers and green trees. Layers, layers, layers! With the potential for a snowy afternoon zip tour one day to a warm, sunny adventure the next, it’s difficult to predict the weather for your zipline outing. AVA suggests you wear long pants and a t-shirt with a sweatshirt and jacket overtop. Pack your snow pants too, as you can always leave them in your car or our outpost during your trip if they aren’t needed. Closed toed shoes are required on both of our zipline courses, and you won’t regret keeping your feet warm on those chilly tour days! When you book a spring zipline adventure with Colorado Zipline, you will meet at either the Idaho Springs or Buena Vista outpost to check in. After you get checked in, you will meet your guide then head to the gear room. There, you will be outfitted in all the necessary gear for your spring ziplining trip, including your harness, helmet and gloves. Ground safety school and a safety talk is next to prepare you for your trip. Finally, you’ll head to the course to begin your adventure! After you complete your spring zipline, you will find yourself back at the outpost, where you can check out your trip photos and reminisce on the breathtaking fun you had soaring among the mountaintops in Colorado.